It’s never easy to face problems relating to missing teeth. Whether your teeth were knocked out, extracted, or have simply fallen out, it’s important to your self-esteem and the function of your mouth to replace them. 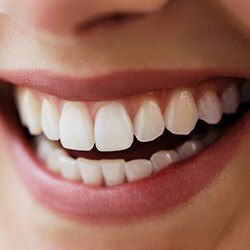 With today’s technology and continually-improving techniques, people don't have to live with the frustration and embarrassment of missing teeth. Compassionate and skilled dentist Dr. Alan R. DeAngelo can provide implant restorations, fixed bridges, and partial or full dentures for our Homer Glen patients to help them reclaim their smiles. Call the dental office of Dr. DeAngelo to schedule your appointment and start getting a new and improved smile. Today’s dentures look completely natural, and improvements in the flexibility of dental materials make them more comfortable than ever as well. Some of our patients prefer dental implant-retained dentures, called overdentures, a more dependable alternative to adhesive-secured dentures. 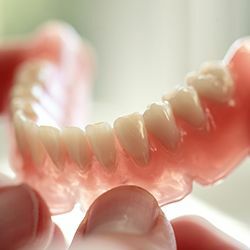 Which Type Of Denture Is Best For Me? Dr. DeAngelo will assess your unique case, and then he'll recommend the best replacement option for your missing teeth. He may suggest dental implants, a fixed bridge, or a partial or full denture depending on your physical condition and your particular dental goals. Full and partial dentures are made of prosthetic teeth anchored to a gum-colored base. A partial replaces multiple teeth and fits in with existing teeth, much like a jigsaw puzzle. Full dentures, on the other hand, replace all teeth on the upper or lower jaw. A bridge is very similar in look and feel to a partial denture, but while a partial denture is removable, a fixed bridge stays anchored within your smile. Usually, partials stay in place with clasps, while full dentures require adhesive cream for security. However, if you would prefer a partial or full denture that will not slip out of place, an overdenture with dental implants may be your best option. Dr. DeAngelo can help you determine the best option for your case.